Just tap the number on the post to see read info from the brochure. in the park for many years. 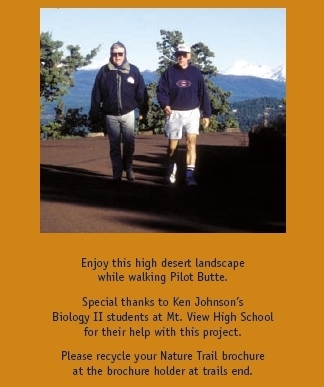 The nature trail brochure came out of a partnership between a biology class at Mt. View High School and the State Park System. A copy of the original brochure can be found HERE for historical reference. This brochure was available at the trailhead for many years. Then it became a victim of the 2008 recession . The park had copies they loaned out through the park host for a long time. Then it went away completely. We've had an online, smartphone friendly version for a couple of years. The park recently put the entire brochure online and it can be found HERE. Rumor has it that the park has plans to take the content and turn it into small interpretive signs placed along the trail. When that happens, this version will be of less use. Got a story about your experience with this brochure? Send it to us at PilotButteInfo@gmail.com and we may post it here.